When you first learn how to drive, regardless of your age, it makes more sense to buy a used car until you gain the experience you need to feel confident driving. This is why many parents pass the family car down to their teenagers or look for a good used one instead of buying them a new vehicle. First time drivers are usually happy having anything to drive but after awhile, many people are ready to invest in their first new car. Shopping for a new car is very exciting but it can be a little confusing, too. With all the different options available, it can be difficult deciding which type of vehicle to buy. However, you can never go wrong when you make your first new car a Toyota. If its one thing Toyota is known for, it’s manufacturing dependable vehicles. People trust Toyotas to last for years because they have a reputation of being reliable when you take care of them properly. In fact, it’s interesting to know that the Lexus ranked highest in the 2014 J.D. Power and Associates Vehicle Dependability Study for the third year in a row! Have you ever wondered why people who drive a Toyota usually buy another one when they are ready to buy a new vehicle? It’s partly due to the great service they received. Your first car is a big investment so it needs to be dependable and that is what you’ll get when you choose a Toyota. Saving money is something that everyone can benefit from, especially while the economy is still recovering from the recession. This is one reason why so many people buy a new Toyota instead of choosing one of the other manufacturers. On top of being dependable, they’re some of the most economical vehicles sold today. They can greatly reduce your fuel consumption, especially if you purchase one of the Toyota Hybrids. Regular maintenance helps to keep your vehicle running smoothly and that’s another area where you can save money when you buy a Toyota. Replacement parts are very affordable and available when you need them, so you can easily keep your vehicle in top-notch shape. When it comes to selection, Toyota seems to have it all. It doesn’t matter if you’re looking for a small economy car or a full size pick-up truck. 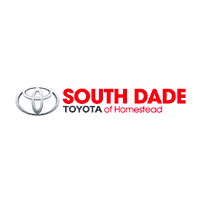 You can find what you’re looking for when you shop with us here at South Dade Toyota. We can even help you find the right vehicle for your needs if you’re not sure what you’re looking for. Your very first new car is special. Many people save for years just to buy a new vehicle, so you want to make a good investment. The selection, dependability and the fact that they are some of the most economical vehicles on the market makes Toyota an excellent choice for your first new car.